Online Application has been started for UGC NET December 2018. Online Application can be submitted from 1st September, 2018 to 30th September, 2018. From December, 2018 “UGC NET” will be conducted by NTA (National Testing Agency). Applications will not be accepted after last date. There are 4 steps in the Application form. Candidates can correct their submitted form by log in to their account. Upper age limit is 30 years as on 1st January 2018. No age for the Assistant Professor. 5 years Relaxation is given in the upper age limit for OBC-NCL, SC, ST and PWD category. Relaxation will also be provided to the research experience students. 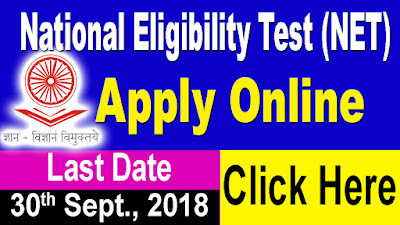 Candidates who have secured at least 50% marks (without rounding off) in Master’s degree or equivalent examination from he Other Backward Classes (OBC)/Scheduled Caste (SC)/Scheduled Tribe (ST)/ persons with disability (PWD) category are eligible for this Test. Interested Candidates can apply online through the official website. Link is given below. For Advertisement Details: Click here. Railway Admit Card for 2018 is now available for Assistant Loco Pilot and Technician and will be soon released for RRB Group D as well. The Railway Admit Card will be available online only. The RRB Group D Admit card for will be available 4 days before the commencement of the exam.